More than just tea was brewing on a rainy night when we first sat down to adapt the libretto of The Werewolf. The task ahead of us would not be easy: transforming Louise Bertin’s rare work, Le Loup-garou, into something with a bite that modern audiences would love. And yet, there we were, sleeves rolled up, notebooks open, and pencils in hand. This meeting of the minds included Teri Kowiak—a brilliant mezzo-soprano and accomplished writer in her own right—and Nora Maynard, Artistic Director of WholeTone Opera and the impetus behind this whole project. Nora’s vision for WholeTone Opera was and still is a simple one: to produce works that represent and celebrate female, femme, and nonbinary composers, performers, and characters. This is a goal I believe in and, as a transwoman in the art world, I’m honored and humbled to be a part of such an initiative. I’m proud to say that the show that has become The Werewolf is a direct manifestation of Nora’s vision. We sat in Nora’s living room, poring over the awkward text. English translated from French is full of twists and turns. Eventually, the story began to emerge: a young and much put-upon woman, Alice, is engaged to a man she dislikes, but her heart belongs to a mysterious man who turns out to be none other than the exiled Count Albéric. Is Albéric the werewolf who’s been terrorizing the town? Well, no, as it turns out, but for the better part of an hour and ten minutes, you’d never know it. Right away, it was clear that a few things needed to happen. 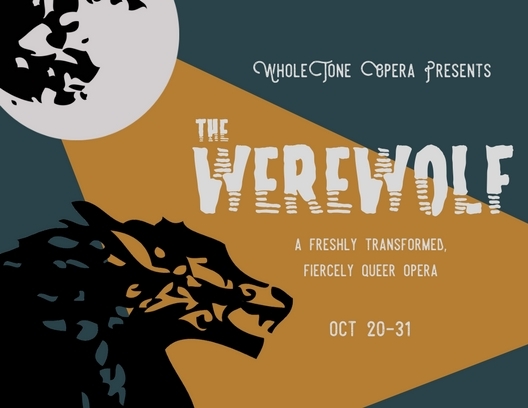 First, unless you’re counting werewolves (and even then, not really), the opera wasn’t doing much to represent the underrepresented. Second, Alice needed some agency of her own. Our audiences would simply not be able to take the helpless, hand-wringy, 19th-century maiden seriously. Finally, and perhaps most obviously, a show called “The Werewolf” was going to need a real werewolf somewhere within it. Easy, right? I can’t remember which solutions came from whom. We were all so gloriously in sync throughout so much of this process that perhaps the same thoughts came to all of us at once. After some brainstorming on the concept of a werewolf, a few exciting options presented themselves. First, following on the theme of transformations and changing forms, it only made sense to include a transgender character. Thus, the role of Vincent was born, and we knew who they were instantly. Each of us had lived Vincent’s story to some degree: a saucy young person, who doesn’t quite fit in, bows to pressure from their overbearing and far-too-traditional guardian until they finally blossom into a new form that’s more beautiful and fierce than anyone could have imagined. Nothing less than that would do. But what about Alice? The audience of the 1820s would have seen and heard a heroine with a gorgeous voice and no backbone. I can’t remember which of us first said the word, “witch,” but once it was thrown out into the room, the pieces fell into place. Just like that, Alice’s transformation nearly wrote itself. The witch has always been loved and feared because she is a powerful woman who doesn’t play by society’s rules. This, we thought, was just what our opera needed. It gradually became clear to us that the whole purpose of the show had shifted. It wasn’t just a light one-act entertainment piece anymore. Now, it was a story about people shedding their false forms and taking on newer, truer ones. Audience members of all persuasions are sure to recognize themselves and the people they know in the characters onstage. My hope is that seeing these characters make the journey from hiding in the dark to dancing in the light will inspire people to do the same. Personally, I have never before worked on a show that has resonated with me so deeply on this subject. But didn’t I mention adding a real werewolf to the mix? Well, we’ve done that, but you’ll have to come see the show to catch a glimpse of him. The Werewolf runs from October 20 – 31 at The Rockwell in Somerville, MA. Performance times vary. Tickets are available from Eventbrite.com.